Britain is enjoying a week or two of early-evening bright ISS passes, and whenever the Scottish cloud cover breaks for the right five minutes I step outside to watch our only space station sail across the sunset sky. Several times in the dark ages before I knew about Heavens-Above and @VirtualAstro and the like I spotted what I thought was the ISS but was actually an Iridium flare. Well! Something like normal service of rants and reflections will I hope be resumed on this blog before too long. What's been going on is that I'm still trying to come up with a plan for my next novel, and have in the meantime been working on a script for an informational comic about stem cell medicine for OptiStem (thankfully completed, on time, and now in the hands of the talented comics artist and writer Edward Ross, his colleague Jamie Hall, and our splendid editor Dr Cathy Southworth - for further developments, watch this space). Any other write-for-hire projects gratefully considered, by the way. Meanwhile, here's a bit of catch-up, working backwards. This morning a photographer from the Scotsman group of newspapers called to take a photo of me for an interview that Stuart Kelly conducted last week, soon to be published in (I think) Scotland on Sunday, in conjunction with the publication of Intrusion. The photography was done in a nearby park, in high winds. (d) whenever I 'endorse' a campaign something toe-curlingly embarrassing happens, the latest being this, in which I and other writers are described as 'launching' and 'spearheading' a campaign which was in fact launched by local trade unionists and organised by, among others, the hard-working activist Pete Cannell, and about which we merely said - at Pete's request - a few words in support. So now it must seem to those actually doing the work that we're trying to take credit for it. I could go on, but let's leave it there. On a cheerier note, there's this (via), a highlight of the third SFX Weekender, which I attended as a guest at the beginning of the month. Just when you thought Neil Gaiman couldn't be more of a legend. The event was a new one on me, a sort of mash-up of what I think of as an SF convention (i.e one organised by SF fandom, and in which any writers and artists present - other than Guests of Honour - are very much on a level with the fans) and what I think of as a media convention (i.e. a convention where the professionals - actors, usually - are the stars, and everyone else is audience). Each has their place, and putting elements of both together in a holiday camp in Wales in February shouldn't work, but in some alchemical way it did. The fandom demographic (you know who you are) extends way beyond the people you meet at SF conventions - as witnessed, come to think of it, by the commercial success of SFX, a magazine which to its credit has always maintained an informed coverage of written SF, which chugs along like a grimy old space-tug in the gigantic fleet of other-media SF/F. I had a good time, but to describe the weekend would be to go over ground already well covered (sometimes critically) by, among others: the Orbit team (to whom thanks); Niall Harrison; Al Reynolds; Paul McAuley; Sophia McDougall; Ro Smith; and Sam Stone (who says very kind things about me). On a likewise cheery note, two of my short stories from last year are on the 2011 Locus Recommended Reading list. 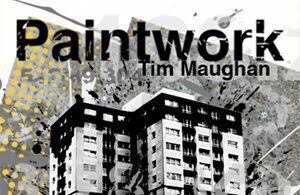 The post below reminds me that I've promised to review Tim Maughan's collection Paintwork, each of whose three stories takes the idea of city environments overlayed with locally-experienced virtual reality - augmented reality - a step or two into the future. They've already been widely and enthusiastically reviewed, and rather than rehash the storylines I'll just flat out recommend them - at a couple of quid for the ebook, it's not much of a risk to check out, and well worth it - and remark on what I think makes them distinctive, which is this. The cyberpunk vision of the future has been around for a quarter of a century - more than long enough to become default. You can handwave it, you can buy one off the jpeg. And like the shiny and trekky and trippy futures that preceded it, it's become in itself an overlay, a mirrorshade between us and the emergent future in the present that cyberpunk once forced our attention on. Tim Maughan is, in these stories, doing with now what the original cyberpunks did with then. I hope he does a lot more of it. 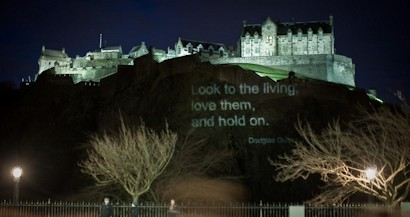 The quote will be projected near the Royal Society building in George Street, with my story as an accompanying audio download. To tell you the truth, though, the story was just as much inspired by the nearby statue of James Clerk Maxwell, which shows the great man apparently contemplating a CD. No spoilers, but if I say 'post-singularity', seasoned SF readers will be able to take it from there.